If you’re looking for a high-quality and stylish boombox, check out the Sharp GXBT9 Portable Bluetooth BoomBox. This innovative device is equipped with a series of hi-tech features and designed to produce amazing quality sound with a sharp, rich texture. The Sharp GXBT9 is basically a battery-powered boombox that runs on 30-Watts of power. Such kind of construction makes it a portable unit as all you need is some batteries for operating this device. Want to know more? Read on to learn more about the Sharp Portable Bluetooth Boombox. 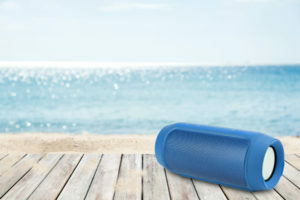 For the convenience of music lovers, the Sharp GXBT9 features Bluetooth connectivity. It also has a built-in NFC tag which makes it easy to pair any Bluetooth enabled gadget with this boombox in a matter of few seconds. It is compatible with all the iPhone and Android devices. The Bluetooth range is just above 30 feet which is more than enough for medium-sized living rooms. So, regardless of what type of smartphone you have, you can pair it with the Sharp GXBT9 without any hindrance. This boombox features an intuitive USB input on its front side. It comes handy if you have some prerecorded music files stored on your USB flash drive. Simply connect the USB to the Sharp GXBT9 and start streaming your favorite audio. If you’re a guitarist, you’ll certainly appreciate the fact that the Sharp GXBT9 incorporates a separate guitar jack in its design. Just plug in the guitar, via the guitar jack, and start dropping some deadly beats for your audience. As compared to its previous model Sharp MX-G10, the Sharp GXBT9 comes with an improved auxiliary hole. When there were all sorts of complaints regarding this particular feature of the previous model, the manufacturer has made sure that no such problem exists with the latest product. The aux feature lets you play music at the highest music volume. This feature is basically designed for music lovers who have an iPod, an mp3 player or any other device. In addition, you can also use the Sharp GXBT9 as a soundbar along with your TV. Just connect a 3.5mm audio jack from the TV to the Sharp GXBT9, and it will produce theater-like sound in your living room. 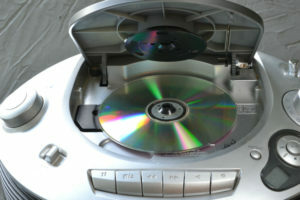 The Sharp GXBT9 incorporates a 2.1 sound system configuration. It means that apart from the main central unit, this model comes with two separate subwoofers. 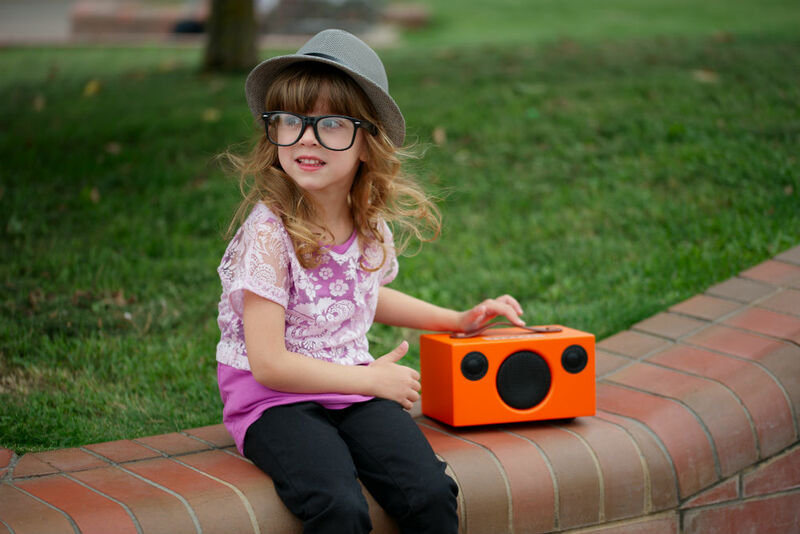 Each of them is placed at one side of this boombox which enhances its sound quality. Another important feature, in the design of the Sharp GXBT9, is the inclusion of a bass boost function. Once engaged, it is capable of producing high-quality bass with a crisp effect. So even if you’re going to play at the highest volume, you’ll still listen to a clear quality sound without any kind of distortion. Featuring a sleek looking design, the overall weight of the Sharp GXBT9 is just above 14.5lbs. 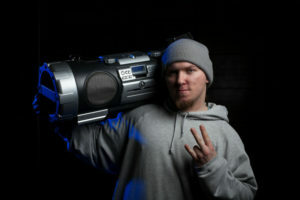 This isn’t the lightest boombox by any means which might be a problem for some customers. 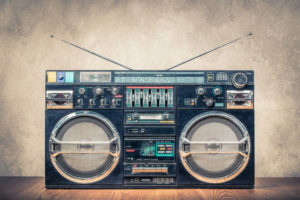 But if you’ve used any sort of audio equipment in the past, you might be aware of the fact that weight plays a considerable role in enhancing its sound quality. With a solid design, this unit is capable of producing high-quality sound on a consistent basis. Furthermore, it won’t get damaged by excessive use. So if you’re going to travel with this unit, this might be a beneficial feature in that sort of condition. Even though this factor has got nothing to do with the sound quality, it certainly helps when it comes to impressing your friends. While playing music, you’ll see a fitting display of LED lights coming out of the Sharp GXBT9. 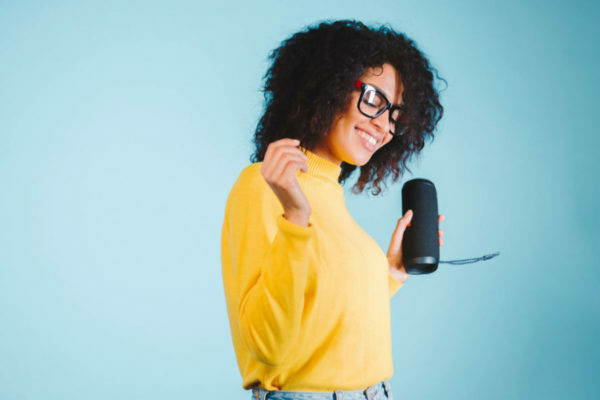 If you’re planning to use this product at a party, you can be sure that this particular feature will impress a lot of music lovers. You will also get a separate remote control along with the boombox. It basically gives you a lot of freedom, as apart from controlling this device via your smartphone, you can also do so with this particular component. The Sharp GXBT9 comes with a one-year warranty, which means that if something goes wrong during that time period, you can always return the model without any hindrance. However, there is a grim chance of any such scenario thanks to its solid design. The Sharp GXBT9 Portable Bluetooth Boom Box combines great style and amazing performance. 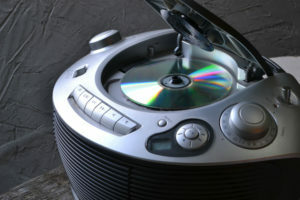 Featuring Bluetooth connectivity, the addition of a USB input along with a separate guitar jack makes it fairly flexible audio equipment. You can also connect your microphones with it, and since it also features an aux input, you can even use it as a soundbar. 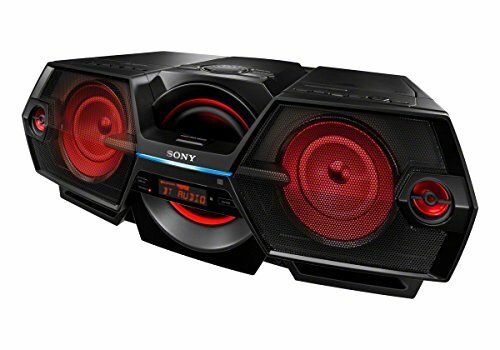 The Sharp GXBT9 Portable Bluetooth Boom Box comes head to head against the Sony ZS-BTG900 Portable NFC Bluetooth Wireless Boombox Speaker System due to their similar price range. These models are made by trusted manufacturers, and both feature a similar 2.1 configuration. But when it comes to other features, the Sharp GXBT9 performs much better as compared to the Sony ZS-BTG900. While the Sharp GXBT9 comes equipped with a mic-input, a guitar jack, and even a USB input, none of these features can be found in the Sony ZS-BTG900. Even though both these models are capable of producing high-quality sound, it’s the Sharp GXBT9 that can be used for a wide range of applications. When it comes to the Sharp GXBT9, it leaves very little to your imagination. 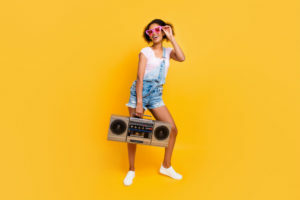 You can connect it to your smartphone, USB flash drive, TV or even guitars making it one of the most versatile boomboxes you can purchase on the market. 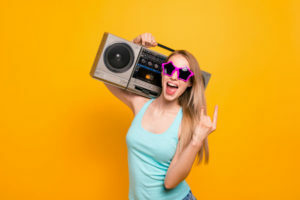 The sound quality is superb as well, so if you’re looking for a high-quality boombox at a very reasonable price, this product is worth a shot. Good review. One question. Others say this is rated at 100 watts RMS. You say it runs on 30 watts of power. What is the difference? Thanks. Hey Tom. When I mention 30 watts, it’s about the power consumption and not about how loud the speakers go. Most people look at the total number of watts to see how loud a music system can play. That’s why a lot of manufacturers display the total number of watts in RMS. The thing is, the RMS value is quite meaningless when it comes to showing how loud a music system can play your music. Check out this article if you’re interested in reading more about the topic. 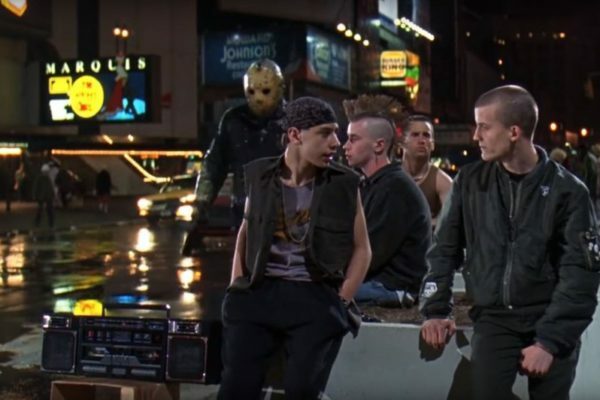 But don’t worry, this boombox sounds really loud and can fill up a room our outdoor space with no problem whatsoever.